This antibody detects Androgen Receptor. It does not detect estrogen, progesterone, or glucocorticoid receptors. Immunohistochemical staining of AR in rat brain results in intense nuclear staining. Fusion protein corresponding to Human Androgen Receptor aa 331-572. Our Abpromise guarantee covers the use of ab3509 in the following tested applications. WB 1/500. Detects a band of approximately 110 kDa (predicted molecular weight: 110 kDa). Immunohistochemistry (Formaline/PFA-fixed paraffin-embedded sections) analysis of human prostate tissue labeling Androgen Receptor with ab3509 at 1/20 (right). Antigen retrieval was performed using 10mM sodium citrate (pH 6.0), microwaved for 8-15 minutes. Tissues were blocked in 3% H2O2-methanol for 15 minutes at room temperature. A HRP-conjugated secondary antibody was used. Left - negative control. Publishing research using ab3509? Please let us know so that we can cite the reference in this datasheet. I would like therefore to get a free of charge alternative antibody. Indeed our final goal is to detect macaque AR in several tissue samples. I’ve have had a look on your proposal and It seems that the mouse monoclonal ab9474 imunogen matches the macaque protein. 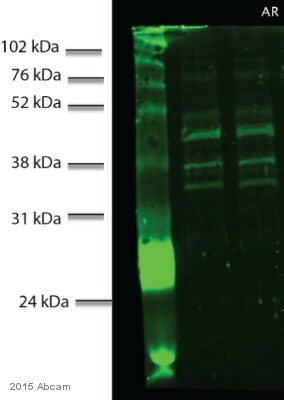 Dou you have any information about the cross reactivity of this antibody? As requested I have arranged for the ab9474 to be sent to you. This is on order number1095362 (purchase order number FOCR JB12-1218). This should reach you tomorrow. If you have any problems receiving it please do let me know. I would also be very interested to hear how you get on with the replacement antibody. Thank you for taking time to complete our questionnaire and for contacting us. I am sorry to hear this antibody is not providing satisfactory results. The details provided will enable us to investigate this case and will provide us with vital information for monitoring product quality. I appreciate the time you have spent in the laboratory and understand your concerns. It is regrettable the results have not been moresuccessful. Having reviewed the protocol details, and the conclusive evidence provided with the other two antibodies used, I believe this product should have given satisfactory results. It appears that you may have received a faulty vial. I am very sorry for the inconvenience this has caused you andwould be pleased to arrange for a free of charge replacement, credit note, or refund in compensation. Having had a look at the alternatives from our catalogue I would like to offer you the mouse monoclonal https://www.abcam.com/Androgen-Receptor-antibody-AR-441-ab9474.htmlor the rabbit polyclonal https://www.abcam.com/Androgen-Receptor-antibody-ChIP-Grade-ab74272.html. Both of these antibodies have been tested in the application you are using as well as the species of sample the protein being detected derives from. If you would like for me to have this sent to you could you please confirm the order number (or purchase order, or the approximate date of delivery and delivery address). Alternatively, if you would prefer an antibody against a different target please do let me know. Thank you for your interest. It is very likely that ab9474 works in mouse but we have no data yet. According to Blast search, the homology between human and mouse AR is very high. http://www.uniprot.org/blast/uniprot/2011101050RXMELAA8 Furthermore, we have some alternative antibodies against AR in our catalogue which proved to recognize mouse AR: ab2742, ab74272, ab3509, ab52615 Normal brain, epididymis, prostate, seminal vesicle; or skin and prostate cancer can be used as good positive control. I hope this helps and if I can assist further, please do not hesitate to contact me. Thank you for your mail. Here, the customer filled with Abcam's questionnaires: WB and IP. Please check the attachments. Look forward to hearing from you for your suggestions. Thanks. If you have any questions, don't hesitate to contact with me please! WB questionaire>> 1. Order details: •	Batch number: •	Abcam order or Purchase order number: AB3509 •	Antibody storage conditions (temperature/reconstitution etc):-20℃,aliquoted 2. Please describe the problem (high background, wrong band size, more bands, no band etc). more bands 3. On what material are you testing the antibody in WB? •	Species: LNCap cell line •	Cell extract or Nuclear extract: cell extract •	Purified protein or Recombinant protein:cell lysate 3. The lysate •	How much protein was loaded: 80-100ug •	What lysis buffer was used:Tritonx-100 1ml, sodium desoxycholate 0.5g, SDS 0.1g, to total volume 100ml with PBS •	What protease inhibitors were used:1mM PMSF •	What loading buffer was used: 4×loading buffer for polyacrylamide SDS -PAGE •	Did you heat the samples: temperature and time:100℃，boiled，5 minutes 4. Electrophoresis/Gel conditions/ Transfer conditions •	Reducing or non reducing gel: polyacrylamide SDS-PAGE •	Gel percentage : 8% •	Transfer conditions: 3h, 4℃,with transfer electrophoresis apparatus 5. Blocking conditions •	Buffer:TBST •	Blocking agent: milk, BSA, serum, what percentage:5% dried skim milk •	Incubation time:1h •	Incubation temperature: room temperature 6. Primary Antibody •	Specification (in which species was it raised against):rabbit anti human •	At what dilution(s) have you tested this antibody: 1:500, 1:1000 and 1:1500 •	What dilution buffer was used: 5% dried skim milk in TBST •	Incubation time:overnight •	Incubation temperature:4℃ •	What washing steps were done: wash with TBST buffer,shaking, 3 times, 10min every time 7. Secondary Antibody •	Specification (in which species was it raised against)?goat anti rabbit IgG •	At what dilution(s) have you tested this antibody:1:2000 •	Incubation time: ,50min, room temperature •	Wash steps: wash with TBST buffer,shaking, 3 times, 10min every time •	Do you know whether the problems you are experiencing come from the secondary?No 8. Detection method ECl+ 9. Background bands •	Have you eliminated the possibility that any background bands could be due to the secondary antibody? (Run a “No primary” control): YES •	Is the blocking step sufficient? YES •	Are your washing steps sufficiently stringent? (Multiple short washes are more effective than fewer longer wash steps) YES •	At what size are the bands migrating? Could they be degradation products of your target? 110kd •	Please provide an image of your blot (as an e-mail attachment, a faxed image is not sufficient) 11. Did you apply positive and negative controls along with the samples? Or documents ?Please specify. 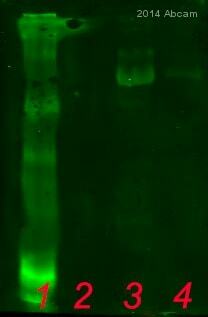 LNCap cell line express AR protein,it must be positive.we didn’t do negative control. 10. Optimization attempts •	How many times have you tried the Western?3 times •	Do you obtain the same results every time e.g. are background bands always in the same place? YES •	What steps have you altered? Primary Antibody dilution concentration, refer to the above item. IP questionaire>> 1. Order details: The same as the WB questionnaire. 2. Please describe the problem (high background, wrong band size, more bands, no band etc). no band 3. Did you test the antibody in WB with a positive control Yes 4. On what material are you testing the antibody in IP •	Species: •	Cell extract or Nuclear extract: Cell extract •	Purified protein or Recombinant protein: 5. The lysate •	What lysis buffer was used: RIPA Buffer •	What protease inhibitors were used: Leupeptin, Aprotinin, Pepstatin and PMSF •	What detergent: NP40, SDS, other : NP40 6. The Immunoprecipitation step How did you immunoprecipitate: Using Staph. Aureus, Protein A Sepharose, Protein G, Protein A/G, Or a second antibody Protein A Sepharose Antibody-lysate incubation: •	How much lysate was immunoprecipitated: 400μl , 2μg/μl •	How much antibody was added to the lysate: 10μl •	How long did you leave the antibody and lysate to immunoprecipitate: Overnight(14 h) •	Temperature: 4℃ •	Was this done under agitation: Yes Addition of Protein-A/G beads: •	Did you pre-block the beads: Yes •	How much beads did you add: 100μl(50%) •	How long did you incubate the beads with the lysate-antibody mix for:5 h •	What temperature: 4℃ Addition of the loading buffer: •	What loading buffer was used: 2 x sample buffer(contain SDS) •	Did you heat the samples: temperature and time: 100℃,5 minutes 7. Western blotting conditions •	Did you load a positive control: Yes 8. Secondary Antibody •	Specification (in which species was it raised against)? Goat •	At what dilution(s) have you tested this antibody:1:2000 •	Incubation time: Room temperature for 50 minutes •	Wash step:1╳ PBS, three times ,10 min for every time •	Do you know whether the problems you are experiencing come from the secondary? Yes, there is no problem with the secondary antibody. 9. Detection method ECl+ 10. Background bands •	Are your washing steps sufficiently stringent? (Multiple short washes are more effective than fewer longer wash steps) Yes, multiple short washes •	At what size are the bands migrating? 110KD •	Please provide an image of your blot (as an e-mail attachment, a faxed image is not sufficient) 11. Did you apply positive and negative controls along with the samples: Please specify: yes, I had applied the total cell extract for positive. 12. Optimization attempts •	How many times have you tried the IP? One time •	Do you obtain the same results every time e.g. are background bands always in the same place? Yes •	What steps have you altered? None. Thank you for providing the customer's full IP and western blotting protocols. Both protocols are very good and I have only a few questions I hope you can clarify: -has the customer tried WB with the RIPA buffer? The WB questionnaire mentions a trionx100 buffer, but the IP questionnaire mentions RIPA, a more suitable buffer to extract nuclear proteins like the androgen receptor. -has the customer tried WB with buffer containing protease inhibitors other than PMSF? The IP questionnaire mentions leupeptin, aprotinin, pepstatin, and PMSF. I think this is a very good cocktail and am concerned that if these inhibitors were not used, the lower bands are due to degradation of the androgen receptor protein. -Has the customer tried incubating more dilute antibody in WB? I tried to compare the images from WB and IP and was unclear as to whether lane 1 of IP is the same sample as the WB samples (LNCap cell lysate). If so, it is strange that the IP image does not show the 110kDa band, can the customer clarify what lysate was run in lane 1? Thank you for providing these few more informations, I really appreciate these clarifications to better understand the customer's problems. Here has one enquiry for ab3509, that is, the customer cann't get the good results for his experiment with WB and IP. In fact ,there has too much bands or signals for him, referred to the attachment. In fact, I have persuaded the customer tried more higher dilution, such as 1:1000 or 1:2000, or IP experiments, after he tried 1:500 with WB and contacted with me. But unluckly, he done the 1:1000 got the 4 strong signals bands and 1:2000, being very weak bands just as he said. Because this customer cann't provide this product's lot number, I am not sure whether or not you accept this case as a complaint, so I made a title as "enquiry". Anyway, hopes to get your response ASAP. Thank you for contacting us for technical support with ab3509. The fact that the customer does not have a lot number is not a problem, we are always happy to help our customers and will try hard to help them, even without a lot number. I would recommend to collect the full IP and WB protocol from your customer, using our questionnaires, once we receive them we aim to reply in 24 hours with an answer. Thank you for asking those details to the customer, I hope we will be able to resolve the problem for them. BATCH NUMBER 178261 ORDER NUMBER 147 DESCRIPTION OF THE PROBLEM Non-specific staining SAMPLE Adult rat brain tissues PRIMARY ANTIBODY Abcam rabbit anti-androgen receptor, 1:100-1:300 overnight at 4°C DETECTION METHOD ABC method POSITIVE AND NEGATIVE CONTROLS USED Positive control: rabbit anti-tyrosine hydroxylase antibody ->worked nicely. Negative control: omitted the primary antibody->no signal ANTIBODY STORAGE CONDITIONS Aliquoted into 10 ul, and stored at -20°C freezer FIXATION OF SAMPLE 4% paraformaldehyde and 4 h postfixation ANTIGEN RETRIEVAL We had tried with/without the antigen retrieval (heat in citric acid) PERMEABILIZATION STEP 0.025% Triton X BLOCKING CONDITIONS 10% normal goat serum in TBS for 2 h at RT SECONDARY ANTIBODY [another company] biotinylated goat anti-rabbit, 1:200 for 2h at RT HOW MANY TIMES HAVE YOU TRIED THE APPLICATION? 4 HAVE YOU RUN A "NO PRIMARY" CONTROL? Yes DO YOU OBTAIN THE SAME RESULTS EVERY TIME? Yes WHAT STEPS HAVE YOU ALTERED? Dilution factors of the primary antibody ADDITIONAL NOTES I have bought many antibodies from abcam and was satisfied with your products. So I changed androgen receptor antibody from [another company] to abcam eventhough I got a good result with [another company] antibody. Unfortunately, I could not get a good result with your product. As my data which I attach, I used same sample for androgen receptor antibody and tyrosine hydroxylase antibody but I got a clear data with tyrosine hydroxylase antibody while there is non specific signal with your product. Infact, androgen receptor is expressed in the nuclear thus the signal is supposed to be only in the nuclear. I am interested in using your antibody, ab 3509, raised against the androgen receptor. I am wondering against which epitope this antibody is raised. I couldn´t find any support mail so therefore I used this mail address. This antibody is a rabbit polyclonal made using the recombinant full length protein from human. Being a polyclonal, it will therefore recognise a number of epitopes across the whole protein.